The Wonder Stuff are a band originally based in Stourbridge, West Midlands, in the Black Country. The original line-up was Miles Hunt vocals, guitar (whose uncle Bill Hunt was keyboard player with Wizzard), Malcolm Treece guitar, vocals, Rob “The Bass Thing” Jones (died July 1993) and Martin Gilks, drums (died April 2006). The group originated from an earlier collaboration with group members of Pop Will Eat Itself, called From Eden, which had Miles Hunt on the drums. 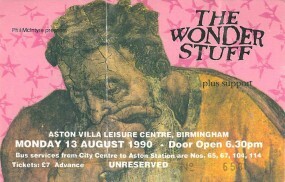 The Wonder Stuff were formed in March 1986, and soon built up a huge following. They entered the studio in September that year to record a self-financed first E.P. “A Wonderful Day”. After signing with Polydor in 1987, the group released a series of snarling, witty pop singles. “Unbearable”, “Give Give Give, Me More More More”, “A Wish Away” and “It’s Yer Money I’m After Baby” (their first top 40 entry) all featured on their debut long player “The Eight Legged Groove Machine” in August 1988 (UK #18) and scored a rare 9 out of 10 in the album’s NME review. The group then headed off on their first headlining 19-date “Groovers On Manouevres” UK tour. Wishing to keep with the tradition of releasing singles that were not on albums (as The Clash, The Jam & The Smiths did before them) they released “Who Wants To Be The Disco King?” in March 1989, and after appearances at Reading and Glastonbury, and tours of Europe and the States they immediately got to work on the second album. “Don’t Let Me Down, Gently” became their first top 20 hit in September 1989, which preceded the release of the album “Hup” in October (UK #5). Another 24-date UK tour followed. The album also saw the introduction of new band member Martin Bell, an accomplished violin and banjo instrumentalist. Martin had contributed the fiddle and banjo parts, notably on tracks “Golden Green” (the second single), “Unfaithful” and “Cartoon Boyfriend”. The album was heavily influenced by The Waterboys’ “Fisherman’s Blues” which had been release a year earlier, with the fiddle being prominent throughout. Several shows during the band’s 1989 tour featured Canadian band Spirit of the West as an opening act. Following disagreements within the group, The Bass Thing left in December 1989, heading straight for America as soon as the group had played the final night of a sellout 3 night residence at Birmingham’s Aston Villa Leisure Centre. A single, “Circlesquare” was released shortly after, and just before Paul Clifford replaced Rob Jones on the bass in the Spring of 1990. This led to a string of live outings for the renewed line-up as new songs were road-tested with the new members on a tour with The Mission in the summer of 1990. With only one single release in 1990 and no album yet ready they put out “Eleven Appalling Promos”, a home video which showed Miles, Malc and Martin doing a commentary between each song. In December after receiving a Brit Award nomination the group opted not to play Wembley Arena, but instead answering a fans letter and playing at a school in Pontefract. The third album was started in late 1990 and completed early the following year. The first single from the new album was “The Size Of A Cow” in April 1991 their first top 10 hit reaching number 5 and was swiftly followed by “Caught In My Shadow” (UK #18) in May, before unleashing the third album “Never Loved Elvis” in June 1991 (UK #3). With Martin Bell more involved in the writing process, the new album was even more dominated by the fiddle and mandolin than “Hup”. After this success came their first headlining stadium show at Walsall’s Bescot Stadium which attracted 18,000 fans, before the group embarked on a 58 date world tour taking in the UK, Europe and the US. For the tour, the band was now augmented by keyboardist Peter Whittaker. Just after the third single from the album “Sleep Alone” in September, the group scored a rare, but predictable, commercial success when they covered Tommy Roe’s “Dizzy” with Vic Reeves in 1991, reaching the top of the charts for two weeks in November and raising the band’s profile. The band carried on touring into 1992 releasing single “Welcome to the Cheap Seats” (UK #8) in February, which was also to be the title of their rockumentary released on video that spring and filmed over eighteen months on the road with the band. Another 33 dates were added in 1992, with a further tour of the States on their own and supporting Siouxsie And The Banshees, plus an appearance on David Letterman, a further UK tour plus a headlining slot at the 1992 Reading Festival, the group then settled down to begin work on the fourth album in late 1992 with recording commencing in spring the following year. After previewing their new material at a few European summer festivals, a new single “On The Ropes” (UK #10) was released in September 1993 followed by the harder sounding “Construction for the Modern Idiot” appearing in October 1993 (UK #4). Another single “Full Of Life (Happy Now)” came out just before Christmas while the band toured Europe before going to the States in February 1994. A third single “Hot Love Now” (UK #19) was released in time for the mammoth UK tour in March, and by the time the “Idiot Manoeuvers” tour came to an end it had been the longest tour they ever undertook with 78 dates since the albums release. There was much tension and disquiet within the group again though and, prior to their performance at the Gloucester Leisure Centre, the members held a meeting where it was agreed that the band would split : Martin Gilks declared his intention to leave the group following the end of the current touring commitments, and Martin Bell had also decided to leave with the intention of expanding upon his work providing music for television shows and soundtracks as a session musician. In addition, Miles Hunt had become frustrated with the inability of the band’s label to promote the current album worldwide and had also decided to leave the group at the end of the current UK tour. With the intention of three members to leave at the end of this tour, it was therefore impossible for the group to continue, and the decision was taken to split. Everyone felt that the group was pulling into different directions musically and personally, and although they had demoed some rough versions of some new material in 1994 they did feel that after four albums and eight years together the time was right to do something else and that the band had started to stagnate creatively. A planned tour in May of the Far East and Australian territories was cancelled. The band made no public announcement at this time, but rumour soon spread after the band’s roadcrew were informed they should seek other opportunities after the end of the tour, and the band framework was quietly dismantled. After much speculation, the group finally announced the split in June by a newsletter to members of their fanclub. After four albums and seventeen singles they performed the final contracted show on July 15, 1994 at a headlining performance at the Phoenix Festival near Stratford-on-Avon in front of over 30,000 fans. In September followed their 18 song “If The Beatles Had Read Hunter….The Singles” (UK #8), a re-issue of the “Unbearable” single (UK #16), and a video of their farewell performance from July. The “Live In Manchester” album was released in July 1995 (although recorded in November 1991) a year after the split. During the split between 1994 and 2000, Miles Hunt was involved in several projects including the hosting of MTV’s 120 Minutes show. He then put together another band Vent 414 whose debut album was released in October 1996 and featuring ex-Senseless Things Morgan Nicholls on bass and later Clash drummer Peter Howard. After being dropped by Polydor prior to the release of the second album, Miles went to work as a solo artist touring America with Malc Treece which saw the release of two albums – “Miles Across America”, an album of new material, Wonder Stuff tracks and Vent 414 material all reworked for the acoustic guitar with the live acoustic album “By The Time I Got To Jersey” following in late 1998. A full studio was later released, “Hairy On The Inside” (again featuring Treece and another fellow Wonder Stuff member Martin Bell) in April 1999, and “The Miles Hunt Club” in April 2002. Meanwhile Malc Treece, Paul Clifford and Martin Gilks formed Weknowwhereyoulive with Ange Dolittle from Eat. They gigged extensively throughout 1995/96 releasing two EPs but then split up. After numerous industry rumours and countless requests from promoters, the NME announced in July 2000, exactly six years after their last performance, that The Wonder Stuff were reforming. Miles Hunt, Malcolm Treece, Martin Gilks, Martin Bell and Peter Whittaker together with new bassist Stuart Quinell were reforming to undertake a one off concert at London’s Forum in December of that year. This soon became five sold out nights, preceded by two nights in Dudley (at the site of their first ever gig), as demand to see the band increased. The group’s previous four studio albums were reissued with bonus tracks and a compilation of b.sides, demos and live tracks, “Love Bites & Bruises” was released in November. More live performances continued into 2001 with the release of a live album “Cursed With Insincerity” in June, and more concerts came in 2002. A DVD release “Construction For The Modern Vidiot” in May 2003 featured highlights from the 2000 to 2002 shows and then a further tour was announced in December 2003. Despite reforming, shows were generally infrequent as some members had full time employment commitments. In total the 2000-2003 reformation saw 25 performances. The band had been considering recording a new album since the reformation – however disagreements within the group had occurred regarding royalties and songwriting credits. Tensions within the band had also risen since the relative high ticket prices of the December 2003 shows, which at £25 were considered by some members of the band to be too high. Poor sales of tickets – presumably due to high prices – on these final shows caused the cancellation of more than one date on this tour. In early 2004, Miles Hunt was informed that Martin Gilks and Martin Bell would no longer work with him, and thus The Wonder Stuff (in the eyes of Gilks and Bell) were defunct. As a result, Stuart Quinell and Peter Whitaker were informed the band had split, and Miles Hunt began work on a new record with Mark McCarthy (ex-Radical Dance Faction) and Luke Johnson (ex-Amen and son of one-time Wonder Stuff manager, Les Johnson). Sessions for this new solo record were later joined by Malcolm Treece, and thus, a new lineup of The Wonder Stuff was born. The decision was controversial with some fans and former members of the band. In late 2004 it was revealed that The Wonder Stuff’s first new album for over a decade, “Escape From Rubbish Island”, was to be released in September that year with “Better Get Ready For A Fist Fight” and the title track becoming singles. Andres Karu (formerly of The Miles Hunt Club) replaced Luke Johnson on drums. The band toured the UK and US extensively in 2004 and 2005 and were joined by violinist Erica Nockalls in March 2005. This line-up continued into 2006 for the release of their new album “Suspended By Stars” in March and the single “Blah Blah La Di Dah” which was only available either on the album or through most music download services including iTunes or Napster. The band toured in March 2006 to support the record and in conjunction with their 20th anniversary. In April 2006, original Wonder Stuff drummer Martin Gilks was killed in a motorcycle accident in London. Later that year, Martin was voted the best British drummer of all time in a radio poll conducted by BBC 6 Music for the Stuart Maconie show. Summer 2006 was occupied with some solo Miles Hunt acoustic shows (which were recorded for a live album, titled “Interloper” and released in October 2006). The Wonder Stuff also began mixing an as-yet untitled live record documenting the March 2006 tour and played several UK outdoor shows. The band finished the year by touring the UK again, performing their final date for the foreseeable future on December 8th at the Shepherd’s Bush Empire. The band went on a temporary hiatus for 2007 due to the imminent fatherhood of Malcolm Treece. However, Miles Hunt (with violinist Erica Nockalls and drummer Andres Karu) recorded a solo album “Not An Exit”, and Miles / Erica toured the record in the UK, Australia and North America. In June 2007, Universal released a new double album of The Wonder Stuff’s BBC recordings compiled from session appearances and concert recordings recorded and broadcast by the BBC between 1987 and 1994. The group released their own live album (‘The Wonder Stuff Live’) in October 2007 taken from tracks recorded at venues and festivals around the UK in 2006. This new album is the first official release of tracks performed under the new line-up and features tracks taken from all of the group’s previous albums. I am will be releasing rare nether before seen footage of the wonder stuff playing at stourbridge town hall may 1986.
can you provide me with a contact for les Johnson manager at that time please. Hi do you have Les Johnsons contact details?